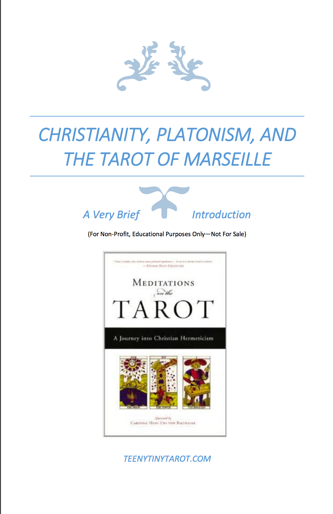 Hermetic Library Fellow T Polyphilus reviews Christianity, Platonism, and the Tarot of Marseille: A Very Brief Introduction [PDF] by TeenyTinyTarot. Here is another free TeenyTinyTarot pamplet that consists mostly of long block quotes from the Meditations on the Tarot. Despite the title, there is no particularly Christian doctrine presented, nor any reference to the history of Christianity. Nor does it engage Platonism, beyond the most generic of dualist metaphysical notions and the name-dropping of Plotinus and of Plato’s Phaedrus. Another curious instance of name-dropping is that of the Traditionalist Sufi Martin Lings, where some specific writing by Lings is apparently at issue, but it is not specified. The text in the current pamphlet has been taken from conversation pendant to a class presented by the anonymous author, a context which helps account for the missing connections and details. This entry was posted in Hermetic Library Reading Room and tagged book, review, T Polyphilus, TeenyTinyTarot on October 4, 2017 by John Griogair Bell.